Favorite Artifact. Statue of a young girl. Marble. End of 4th century BC. Greece. KM 1979.5.1. Why. “It’s thought that this statue honors the goddess Artemis, who was the daughter of the all-powerful Greek god Zeus and mistress of animals. Initially, this sculpture caught my attention because I thought it was pretty, especially the dress and its draping. I liked the figure’s stance with its slightly outstretched foot, and how the dress drapes over that foot. “But as I read more about it — in a 1982 article by former Kelsey Museum director John Pedley — I learned about the arkteia, an ancient Greek ceremony held every five years to honor Artemis. “During the ceremony, according to Pedley, young girls holding torches danced around her altar, mimes represented Artemis in the act of hunting, and young girls between the ages of five and ten wearing characteristic crocus yellow chitons and bear masks (arktoi) also took part. The head, now lost, was worked separately, and set into a deep cavity. The arms are also gone, both being broken just below the shoulder, though traces of the right hand and the angle of the shoulder show that the arm was held straight down with the hand against the drapery by the right thigh, while the angle of the upper left arm and left shoulder suggest the possibility that the left arm was bent at the elbow to join a mass of drapery collected at the side of the figure. … The figure stands with weight on the left leg and the right, free leg, placed laterally and drawn somewhat back. The left leg is invisible beneath the drapery, though the toe of the shod foot protrudes beyond the hem of the folds. The bent right knee shown frontally is detectable beneath the folds of the cloth, with right foot turned somewhat outward. Neither heel is visible at the back. She wears the high-girt chiton with shoulder straps and buttoned sleeves …. The Kelsey Museum acquired the sculpture, purchased with funds contributed by the Kelsey Museum Associates (now Members), from the Swiss market in 1979. Background. According to Pedley, the east coast of Attica was famous in antiquity for the sanctuary of Artemis at Brauron. The sanctuary stands near a river between Marathon and Cape Sunion, directly opposite Athens to the west. Origins and details of the arkteia festival ceremony are obscure, he wrote, but seem to center on a myth that told of the killing of the bear sacred to Artemis. This sacrilege was to be atoned for, or made right, at the festival by daughters of leading Athenians playing the bear, or arktos. The arkteia ceremony was part of the great Brauronia festival, which included chariot races and musical contests. Find It. On the first floor of the William E. Upjohn Exhibit Wing, find the Greek exhibit case, which faces the windows. To the right of the case, the statue of a young girl stands in a trio of sculptures out in the open. She also faces the windows. Learn More. 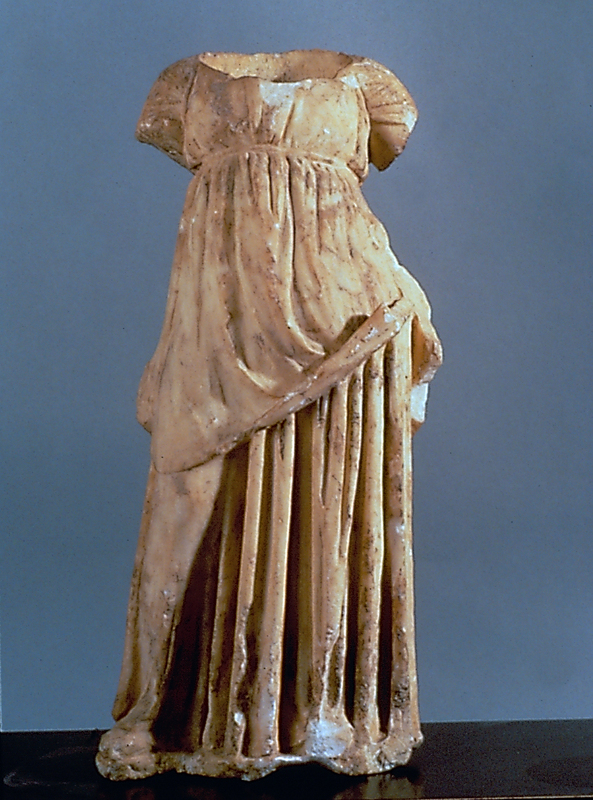 John Griffiths Pedley, “A Fourth-Century Greek Statue in Ann Arbor,” Bulletin of the University of Michigan Museums of Art and Archaeology 5 (1982): 6–11.